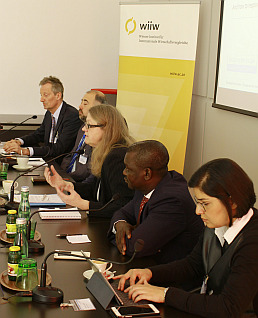 On April 18th, experts from four refugee-origin countries and the Bertelsmann Stiftung discussed national and EU policies necessary to tackle outward migration of workers and refugees. A note by Julia Grübler. According to UNHCR statistics there were more than 16 million refugees and additionally more than 3 million asylum-seekers worldwide by the end of 2015. These figures are dwarfed by the number of internally displaced persons, amounting to more than 37 million people. Only 6% of all displaced people were hosted in Europe. Nonetheless, Europe plays an important role. EU policies in particular can influence, (i) where people are moving to, (ii) how dangerous the journey is for their lives, and (iii) whether there will be a safe home country they might in the future be able to return to. 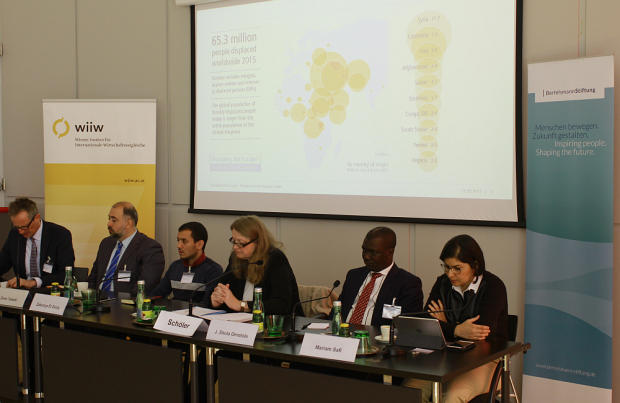 The Bertelsmann Stiftung asked experts of refugee-source and -transit countries to shed light on the peculiar situations in their countries and discuss national and international policies to overcome the challenges leading to mass migration. Their insights are presented in the newly released publication ‘Escaping the Escape – Toward Solutions for the Humanitarian Migration Crisis’. Four authors of this publication presented their views on Tuesday, 25 April 2017, at Presseclub Concordia (Vienna). Afghanistan is not a safe place to return to. Reintegration is particularly difficult for people returning from Europe. Miriam Safi (DROPS) reported that out of about 400 districts of Afghanistan, 177 are under the rule of the Taliban and still contested. Security concerns are the primary push factor for migration. The majority of migrants move to Iran and Pakistan. Integration of people returning from Europe is much more difficult as they have typically sold all their belongings and lack any base for a restart in their home country. Reintegration programs are very rudimentary and mostly ineffective, given the bad labour market and security situation. Regarding EU policy, she saw the potential for helping to establish law enforcement agencies and scholarship programmes for training not necessarily in Europe but also in the Asian region. Conditionality of international support is key for improving the situation in oil-dependent Nigeria. According to Shola Omotola (University Oye Ekiti) people from Nigeria primarily leave their home country for economic reasons. The promises of independence in the 1960s, of the structural adjustment programmes in the 1980s, and of democracy in the 1990s were not fulfilled. Nigeria is still strongly dependent on oil. Its economy therefore performs according to international market trends and is, in addition, threatened by militant groups in regions with oil deposits. He identified two areas where the EU could support Nigeria: first, by providing technical assistance to diversify the economy, and second, by providing only conditional support in order not to increase inequality and corruption. Being one of the main transit and host countries for refugees, focused efforts to combat smugglers are urgently needed in Libya. The idea that ‘the grass is greener on the other side’ (or ‘migration illusion’) is strongly advertised by traffickers. Zakariya El Zaidy (Danish Refugee Council) urged for smart border control. Fences and walls make refugees only more vulnerable by forcing them to use the service of smugglers to illegally cross borders. In addition to thousands of people dying in the Mediterranean, there are even more people dying in the attempt to cross the deserts, he emphasised. Fighting human trafficking should rank high on the EU policy priority list. Migration from the Western Balkans increases as prospects for EU accession are deteriorating. Speaking of the Western Balkan countries not as transit but rather source countries, Dane Taleski (South East European University) presented pull and push factors directly linked to EU policies. In his view, neither the economic nor the democratic transition in the Western Balkan region has been successful. Without a realistic chance to become part of the EU project while facing persistent corruption and deindustrialisation, particularly young people are pushed out of the region, leading to brain drain. The diaspora of the 1960s and 1970s resulted in a big community in the EU, constituting an additional pull factor. Chapters 23 (Judiciary and fundamental rights) and 24 (Justice, freedom and security) as conditions for EU enlargement have been opened with Montenegro and Serbia. According to Mr Taleski the opening of more chapters such as 14 (Transport policy) and 15 (Energy) should be complementing the Berlin Process as infrastructural investments will improve prospects. According to Mr Taleski speeding up the EU enlargement process would be ‘the best policy’ to foster sectoral integration and incentivise the reform of economic and political structures.